This interesting piece is the original work of Konstantin Danshin. 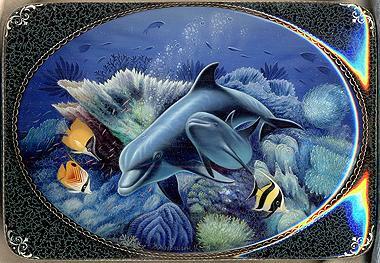 It shows a mother-dolphin and its cub swimming in the ocean's depths. The sunlight struggles through the underwater caves, and illuminates whimsical water plants, corals and bright, colored fish. The great skill is needed to reproduce the atmosphere of an underwater world! Silver punch-outs (silver scan patterns) are used to decorate the box's exterior; they decorate the edges of the lid, and they also can be found wrapping around the sides of the box. The part of the box's exterior imitates a stone color: light green veins are scattered against the dark background.The bottom of the box's exterior is painted black. The interior is traditionally covered with red lacquer. The box is constructed from paper-mache. It has a hinge from the top of the scene, and rests on a flat bottom. The work is signed with the artist's name.